All involved at Fylde RFC have been saddened by the death of the club’s former chairman of rugby David Leslie at the age of 73. All involved at Fylde RFC have been saddened by the death of the club’s former chairman of rugby David Leslie at the age of 75. A devoted member of the club’s general committee, Leslie also served as chairman of discipline at the Woodlands club, having also been a member of Thornton Cleveleys RUFC. Born in Scotland, Leslie also had a distinguished career as a rugby union referee. A highlight of his refereeing career came in 1990, when he took charge of the Twickenham clash between England and Wales in what was then the Five Nations Championship. Leslie was also president of the Manchester Referees’ Society. He was a very good player in his youth before taking up refereeing in Scotland. After moving south for work reasons, Leslie joined the RFU's Referees Panel and officiated at top level club fixtures, such as Leicester v Harlequins, before being appointed to internationals. He took charge of some huge international fixtures, including France v the All Blacks. David joined Fylde in 2000 when he retired from refereeing and was chairman of rugby in 2006-7. He featured in a Gazette story last year, when he saw off a would-be burgler at his Lytham home with his walking stick. David is survived by his wife Barbara and his two children by an earlier marriage. Although gravely ill, he was delighted to hear recently that his grandson was joining Fylde Colts for the 2018-19 season. Fylde chairman Dave Young said: "I was saddened to hear of David’s passing. I have great memories of him as a top referee and a regular at Fylde matches in my playing days and more recently as a loyal club member who contributed to the club in a number of roles. He was always happy to share his thoughts on rugby and the club with me. On behalf of the club, our condolences go to Barbara and all his family." 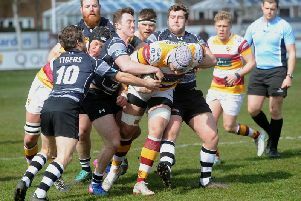 Former Fylde head coach Mark Nelson said: "I first met David when I was playing for Lancaster RGS in a big school match against Rossall. "David has had a superb career as a referee all over the world at senior club and International level but it’s a mark of the man that he can remember schoolboy games from the '70s and has been so enthusiastically involved in rugby from the very top of the game right down to the grassroots and all levels in between. "Many people will speak of David the rugby man but, beyond that, I will remember and miss him as a trusted friend and confidant through good and bad times. "He was a man of great wit and humour and very good company. More importantly, he was a loyal and steadfast friend to many folk at Fylde and beyond. He was passionate for the clubs he was involved with to succeed and gave his best in all his roles with Fylde. Rugby has lost a special person. "I will miss David very much and send my deepest condolences to Barbara and the family. The final whistle has gone but it was a fantastic game." Bill Beaumont, Chairman of World Rugby and Fylde RFC Member, said: "This is very sad news. David was an outstanding club man and an excellent international referee. I was commentating for the BBC when he refereed his first International game. He was always encouraging to all young referees and a great role model. He will be sadly missed."